Observation - bug1 - UK and Ireland. Description: About 0.8mm long, on the underneath of a sweet pepper leaf indoors. The larger insect to the left is some kind of winged aphid. About 0.8mm long, on the underneath of a sweet pepper leaf indoors. 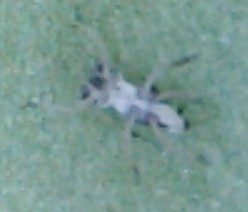 The larger insect to the left is some kind of winged aphid.